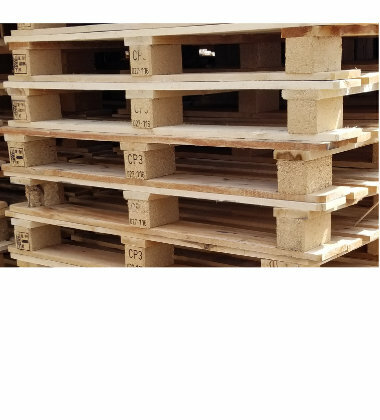 Please send me a price for the PWU-1140-CP3-B 44x44 used wood pallet. The open style top of this wooden pallet typically uses evenly spaced deck boards on the inside with larger lead boards at each end. Use this stackable wood pallet in your closed loop system or as part of a return program for sending the wood pallet back in stacks. Built for strength and stability, this wooden racking pallet is custom designed specific to your system in either two or four-way entry. Graded and sorted by condition, this wooden pallet may have a little wear but is still full of life and ready to re-enter the supply chain. This wooden pallet is built in a custom size specific to your application using our own plants and a network of wood pallet partners. Safely place boxed food and drink on this wooden pallet for delivery to customers or for storing product with no direct food contact. Lighter materials takes center stage with this one-way wooden pallet custom designed to get the most product safely shipped at once. This multi-trip wooden pallet is custom built to be heavy-duty but results in a lower cost per trip when added to a pallet return program. Strong enough to be used again and again, this captive wooden pallet is custom built specifically for use in your DC or warehouse. Made from heat treated lumber, this custom wooden export pallet resists wood pests and is stamped per all ISPM 15 specifications. This wooden pallet is custom built from materials that offer a lighter weight pallet for air cargo transport and lower air freight charges. Images shown for illustrative purposes only. Actual product will vary. *Not all used pallet load capacities are available. Estimated safe load capacities are based on full pallet coverage. We reserve the right to change any stated information without prior notice. Not responsible for typographical errors. All used pallets have been inspected for damaged components. Pallets may have limited cosmetic damage, but all are structurally sound. Is the PWU-1140-CP3-B the right pallet for you?